[RR] “You guys want to join us for Gutshot Straight?”1 Roderick the Rock asked. [FF] “The new Steven Seagal poker movie?” Figaro the Fish inquired. California Split 1974 Bill Denny (George Segal) and Charlie Waters (Elliott Gould) team up to gamble and have fun but go broke; pawning all their possessions, they head for the big poker game in Reno. Casino Royale 2006 James Bond (Daniel Craig) plays in a $10,000,000 buy-in Texas Hold ‘Em tournament with the terrorist banker Le Chiffre (Mads Mikkelsen). The Cincinnati Kid 1965 The title character Eric Stoner (Steve McQueen) plays high stakes stud against the old master Lancey Howard (Edward G. Robinson). Deal 2008 Retired poker pro Tommy Vinson (Burt Reynolds) trains hotshot Alex Stillman (Bret Harrison) then unretires and faces him in the WPT championship. The Grand 2007 One Eyed Jack Faro (Woody Harrelson) and others improv their way through a poker tournament. Lucky You 2007 Huck Cheever (Eric Bana) tries to beg, borrow, and steal $10,000 to play in the WSOP Main Event. Billie Offer (Drew Barrymore) is a love interest and victim. Maverick 1994 The title character (Mel Gibson) tries to win a $25,000 buy-in, winner-take-all, 5-card draw poker tournament in the Wild West. Poker Night 2014 Policeman Stan Jeter (Beau Mirchoff) plays poker with other cops, gets locked in a basement with a young girl by a psychopath (Ron Perlman), and needs to use what he learned at the poker table to escape. Rounders 1998 Mike McDermott (Matt Damon) is studying to become a lawyer, but his heart belongs to poker. He and buddy Lester Murphy (Edward Norton) play in a variety of games to try to settle the Worm’s poker debts. Shade 2003 A group of small-time con artists try for a big score in a poker game. All In: The Poker Movie 2009 The post-Moneymaker poker boom with interviews of many poker pros. Bet Raise Fold 2013 Online poker from the early 2000s through Black Friday as seen through three poker players. Drawing Dead: The Highs & Lows of Online Poker 2013 Poker perspectives from a successful online pro and a struggling gambling addict. High Roller: The Stu Ungar Story 2003 The story of the 3-time WSOP Main Event champion, flashing back from his death bed. At least until Rounders 2 comes out. This film also deserves a footnote in the Poker Reality Television Shows post. [RR] “Interesting parallel to the flop, the turn, and the river in Texas Hold ‘Em”, Roderick the Rock noted. [LL] “I’ve never heard anyone claim that poker’s turn comes from the magic term, but it makes some sense, as both are in the middle”, Leroy the Lion continued. [SS] “After the first shuffle, the cards are in pairs, with clubs and hearts together and diamonds and spades together. After the second shuffle, the cards are sorted by denomination. After the third shuffle, the cards are matched with their opposite denominations (e.g., deuces with eights and nines) and opposite suits. After the fourth shuffle, the cards are in groups of four, spaced out denominationally, one of each suit. After the fifth shuffle, the cards are five apart denominationally (decreasing), with suits almost paired. After the sixth shuffle, the cards are four apart denominationally, with suits in groups of three or four. After the seventh shuffle, the cards are two apart, with suits together (two batches). The riffle shuffle is definitely the best of the six common shuffling methods. The Overhand Shuffle (pulling cards out from the side of the deck), the Hindu Shuffle (pulling cards out from the end of the deck), and the Strip Shuffle (basically just repeated cuts) are very inefficient. The Weave Shuffle or Faro Shuffle (forcing two half decks together along their edges) is too good and not good for the cards. Specifically, this is an out shuffle, where the top and bottom cards never move. If the top card of the bottom half of the deck becomes the new top card each time instead, it’s an in shuffle. While the out shuffle takes eight iterations to return the deck to its original order, the in shuffle inverts the deck after 26 shuffles and restores it after 52. Note: there are two main flavors of the riffle shuffle. The common method lifts the short edges of the halves high and merges them together, with or without a subsequent bridge. The casino method merges the corners of the halves together. This is better for the cards and much less likely to expose the card faces. See the beginning of this shuffling video (longer explanation). The entire sequence of riffle-riffle-strip-riffle-riffle-strip-riffle-riffle-strip-riffle will produce a shuffled deck random enough for anyone. Judson G. does eight perfect shuffles in a record 36.45 seconds (using weave shuffles). Copag began producing plastic playing cards in 1908. Playing cards existed by the 9th century (middle of the Tang Dynasty). Ironically, the most famous Chinese card game is now played with tiles. Mah jong is based on a card game created during the Ming dynasty (1368-1644). Copag claims only that their cards last twenty to fifty times as long as plastic coated playing cards. CardPlayer published an article on the card switch on May 5, 2016. [UU] “What’s that you’re using as a card protector now?” Umberto the Unlucky asked Deb the Duchess. [RR] “I thought he sold that to Howard Lederer”, Roderick the Rock informed. 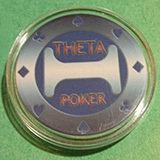 There will be no foreign objects on the table except for a maximum of one card cap (also known as a card protector). Like Yoda, Stewie, the Buddha (first Poker News article), Bugs Bunny, and the dragon (second Poker News article). Quoted from the 2014 WSOP Rules, Section 106 (Foreign Objects). The Poker Grump encourages using card protectors. ACH is short for “Automated Clearing House”, an electronic banking network. DOJ is the “Department of Justice”. 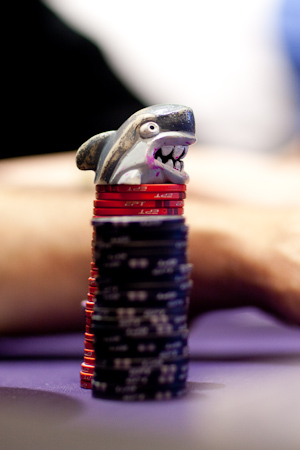 PokerStars bought Full Tilt Poker on July 31, 2012. Nevada legalized online poker on April 30, 2013, Delaware half a year later, and New Jersey another month later. See the legality section of the Wikipedia article on online poker.